Africa: Nigeria, Zambia, Uganda , Kenya,Zimbabwe,Angola,Ghana , Algeria etc. Europe: UK,Spain, Portugal, Turkey , Roumania etc. Asia: Singapore , Thailand , Malaysia , Pakistan etc. International Q235 material, Good elasticity, not deformation, not flagging for life. Add the perfect electrostatic spraying technology; not rusts, service life can reach 15 to 20 years. 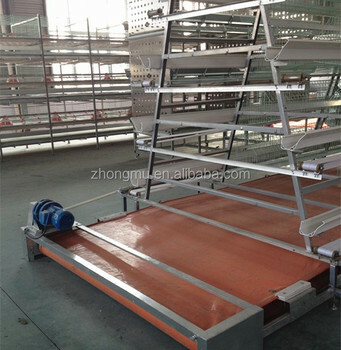 Scientific design for the chicken cage can ease the fatigue degree of the chicken, increase the laying rate, Reasonable space arrangement, Make accident mortality of chicken in the cage is zero, damage rate of eggs is zero. Electrostatic Spraying technology slove the questions about cold galvanized cage short life time and hot galvanized cage surface not smooth and more environmental. Full new PVC material, resists compression, heat-resistant, not deformation, no broken. Using life is for 15 years. High compressive capacity: adults can walk random on the cage. International 3MM thick plate rack, U shape design. Can withstand 350-kilogram pressure. Plus double galvanized, use life is for 15 years. The fully closed design, pressure regulating and filtration together, can regulate the water arbitrary length pressure of chicken cage. Zhongzhou Animal Husbandry Breeding Equipment Co., LTD is one of the largest automated animal husbandry breeding equipment manufacturing enterprises in China, Establish in 1998, located in xiping country, Henan province, Near 107 state road, nest to Beijing-Guangzhou Railway and Beijing-Zhuhai Expressway, so the transportation is convenient. Our company has strong technical power, advance machinery and equipment, superb production technology logy, has more than 30 senior experts, engaged in the research and development of new products, to create the best products in domestic and overseas first-class industry. From 2012, Pioneered the use of Electrostatic plastic spraying automatic production line, Completely solve the hot galvanizing is not smooth, cold galvanizing short life and the environment pollution problem. We produce all of the automatic system for chicken, pigeon and quail. The products sell well in the whole China and export to Africa, Southeast Asia and middle east. Our company awarded Good Faith Business Units, quality trustworthy organization. Welcome customer from all over the world to visit our factory. We are looking forward to establishing long-term business relationships with you. Zhongzhou will offer the best services for you. If you are interested in our chicken breeding equipment, please feel free to contact me, I shall be pleased to send you our catalogue and best price. Following are our contact information.